Committee meetings are usually called by the higher management of the company when they need to hold important discussions regarding the functioning of the company or organization. Committee meetings are scheduled every month for discussions of the progress of the company and to update team members about business proceedings. First, when you create the agenda, you are creating the roadmap of the meeting and planning the outcome. The second main purpose is to let the participants know what the meeting is about and what is expected of them. Committee meetings are often difficult to arrange unless the management of the company has ensured that a committee meeting agenda has been prepared well in advance. Creating a committee meeting agenda template means you are making a road-map with certain outcomes which will keep in mind during the meeting to make the agenda successful. 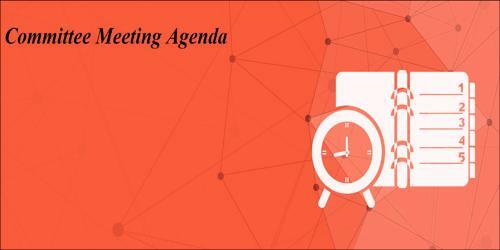 To get an effective committee meeting agenda template, one should keep in mind that the only target of this agenda is to make the meeting straightforward as well as maintain its purpose properly. Therefore the committee meeting agenda must be prepared at least a week in advance to ensure all committee members are present at the meeting on the scheduled date. The committee meeting could be a discussion about the product or service, plans and methods of boosting the revenue of the company, discussions of company progress or even for providing the latest updates to the committee members. A business committee meeting is a gathering of business departments as well as groups which are working to meet the target that is explained under these templates. The committee meeting is always called by the president or the chairman and the invitees in most cases are the committee members that are immediately assigned the responsibility of reporting to the highest office. While the options of inviting people other than the committee members certainly remain at the discretion of the chairman. Such instances are rarely noted because committee meetings on all occasions may also discuss confidential matters which the management of the company would not like to disclose to other members. The agenda should be prepared in a formal language and also specifies the most important points of the meeting according to the information he or she has received from their immediate bosses. An effective agenda helps to take any crucial decision with the majority of members.